This course is very useful. This is a very important and valuable lesson discussing resolution, uncertainties, and errors. It is difficult material and it's an advance to greater depth of discussion than most MetEd lessons. However, the difficulty is increased by incomplete information in some exercises and incomplete explanations of some of the answers there. Also, the appendices are terse and could be improved by leading the reader more slowly through the topics. i gain more knowledge through your lessons so I thank everyone had participate in the preparation of these lessons! The lesson was good for learning though i found some topics a little bit hard. 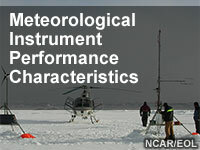 Define and explain the static performance characteristics of an instrument. Describe the process of static calibration. Identify the difference between static and dynamic performance characteristics. Describe how the principle of superposition relates to signal analysis. Describe the dynamic performance characteristics for a first-order system. Distinguish between a first and higher order measurement system and associated energy reservoirs. Describe representativity and homogeneity by identifying features within an application that could generate internal boundary layers and affect these characteristics. Distinguish between Type A and Type B uncertainty. Apply the Law of Propagation of Uncertainty to a system of multiple sensors.